A cool head during a pressure moment, the last minute winning drop-goal against Swinton was exactly the kind of scenario Simon Brown was pressed back into service for. With the Eagles in a tough spot against the Lions on Sunday, it needed the experienced half-back’s boot to clinch a dramatic victory after the home side had levelled the game just moments before through Chris Hankinson’s converted score. 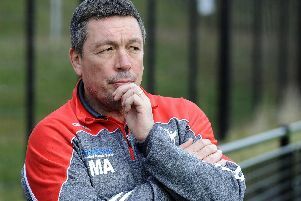 Brown, brought back just six weeks after leaving the Eagles just prior to the season, has been given the task of being coach Mark Aston’s leader on the field, with the ex-Hunslet ace taking the responsibility of slotting the crucial one-pointer which moved the Eagles out of The Championship relegation zone. “Is there any more grey hairs on me? I'll be fully grey by the end of the season,” a relieved Aston told The Star. The Eagles went into the crucial early season four-pointer knowing defeat would leave them propping up The Championship standings, but Brown’s late heroics takes Aston’s side above Rochdale who join Swinton in the bottom two. Whilst not a game for the rugby league connoisseur, Aston’s troops showed plenty of fight and desire which their experienced coach has questioned at times this season, whilst their character was there to see after Swinton came back from 8-18 down to level inside the closing stages. With the Eagles already missing a one-point attempt through Oscar Thomas, Brown wasn’t going to miss the second chance as he sent the travelling support wild to clinch it at the death. "Even with the first attempt through Oscar Thomas it was set up perfect,” Aston continued.“He flicked it to Browny who put it back, but he just lifted his head up and it went. It did what it did.